If you have played Fruit Ninja, then you don’t need any introduction to iSlash Heroes. But instead of slashing colorful fruits, you will use your virtual Katana to cut wooden boards into pieces. Shining metal shurikens will stop you from slicing up a board, so you will need to be quick and chalk out a proper slashing strategy to reach your objective. 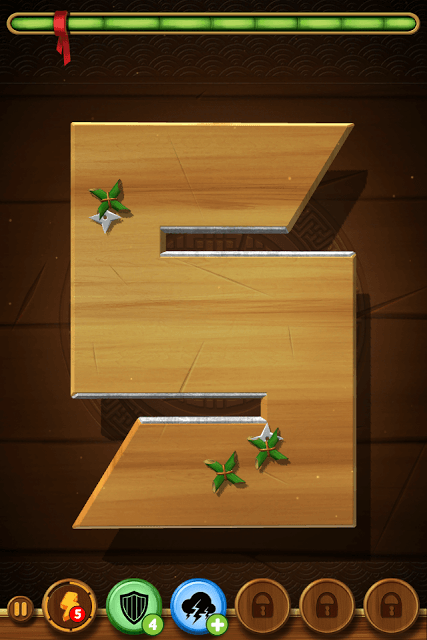 The points you receive after finishing a level relies on how much of the bamboo cane is being cut down, the time and number of slashes it took for you to reach the knot. 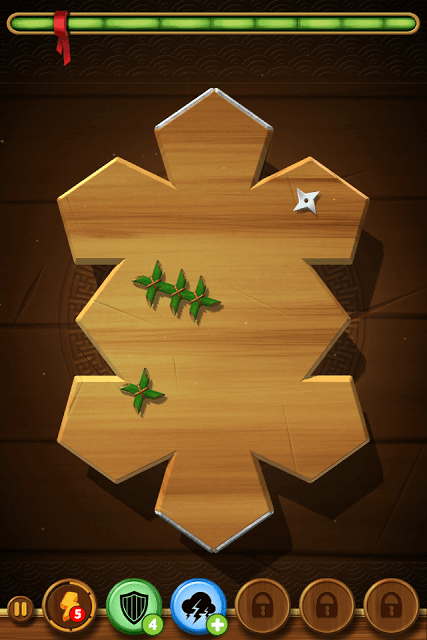 While slashing wooden boards, keep an eye on the bamboo cane at the top of the game screen. You will get more points if a large portion of a bamboo is snicked at one swipe and to do this will have to slash a large part of the wooden board. Chances of getting a golden Buddha statue are more if you cut a large chunk off the wooden board. Extra points will be added to your total if you take less time to reach the red ribbon tied to the bamboo. There is no visible timer here, but an invisible timer gets activated when you swipe the screen. Again your strategy should be to slash larger chunks of wood off the board. The faster you will reach the knot, the more points you will earn. You can also earn more points if the swipes are fewer in number. Cut large pieces of wood off the board to reach the knot faster and this way it will take you less swipes to reach your objective. If you follow the above strategies, you may also earn three stars. The more stars you get, the more Tai-Chi (Yin-Yang) symbols you will receive. These symbols can be of immense help during boss battles. When battle starts, the game provides battle boosts that can be purchased using Tai-Chi symbols. These battle boosts inflict extra damage to enemies. Adding these boosts to your Katana will decrease enemy health faster. Spend 500 Tai-Chi and you can inflict +1 damage to enemies. Spend 1000 to inflict 2 extra damage to an enemy. Try to win a boss battle without using a battle boost first. Note down the boss’s ability and examine the board. The game provides a brief snippet about your enemy’s special ability so note down that first, then examine the board and then try to defeat enemy without using any battle boost. In case the enemy’s too tough, you may use the +1 damage boost. Remember that Tai-chi symbols are hard to earn. You will have to earn at least 3 stars to get 150 symbols. Try to get at least 2 stars in a normal level to earn more symbols and save them for harder boss battles. Before slashing, examine the board’s design. You will have to revise your slashing strategy according to the board’s structure. Since you can slash in any direction, try to swipe down or up if it is harder for you to cut the board in half horizontally. You may even swipe diagonally. Look at both edges of the board and identify those that do not contain iron obstacles. You will need to swipe from one corner to the other to cut a board into two pieces so make sure there are no iron obstacles on either side. Go for larger chunks instead of cutting smaller pieces if you want to cut a large portion of the bamboo cane or if you want a Golden Buddha statue. Tapping on the statue slows down time for a few seconds. When the game enters slo-mo, try to swipe quickly in any direction to achieve a combo. Do remember that if you hit an iron shuriken, you will have to replay the game. However, you can slash through a green leafy shuriken. Keep an eye on shuriken movement patterns. Some move slowly from one corner to another inside the wooden board, whereas others move quickly. When a part of the board does not have any moving shurikens inside, it can be slashed off. Once the board becomes smaller, it becomes much harder to slash it down further because the shurikens move much faster than before. You can cut smaller piece to reach the knot but this will earn you fewer points and stars as you will take more time and swipes to do so. You may come back later if you fail to score more or get 3 stars in a level. You can quickly swipe on a wooden board immediately after cutting a part of it. And you can do this when a piece of wood flies up in the air. When it flies towards you, swipe on another empty part of the wooden board. You can still cut a part of the wooden board even though the piece of flying wood comes in between your slashes and the wooden board. Each boss has a unique ability and you will have to change your slash tactics based on his ability. For some bosses, you will have to quick in slashing down the wooden board to pieces. You will also have to spend tai-chi symbols to purchase extra damage because they will do anything to prevent you to reduce their health to zero. When the game starts, a board will describe your enemy’s ability. Go to battle without using a damage boost and check how the boss reacts to your slashes. Only then you will be able to devise your own strategy and may decide later whether to use damage boosts or not.